Sydney Australia is renowned for its opera house, the billowing sails design making for instant recognition all over the world, and with Sydney Harbour cruises, you can see this stunning masterpiece from the comfort of a cruise ship. Fully commentated sightseeing cruises are part of the package when you choose Captain Cook cruises Sydney. Choose from a daylight tour, a sunset cruise or one at night with the city lights as your breathtaking backdrop. Each tour is conducted on a small ship that will get you up close to the grand Sydney Harbour Bridge, another instantly recognizable architectural wonder that is pure Sydney. High tea, coffee cruises, Harbour highlights cruises, cocktail cruises and even cruises out to watch the migration of the great whales are all offered on Sydney Harbour cruises. Partake in a Sydney Harbour dinner cruise where you are not only offered all the sights and sounds that make this an amazing place to be, but also to world class dining and attention to detail. Perhaps a breakfast cruise is for you, with the sunrise and spectacular breakfast menu amid the wonders of the Harbour. Cruises can also be hired for special occasions, parties or private tours of the bustling port. Enjoy your few hours on the water or opt for an overnight cruise featuring spacious accommodations and wonderful dining opportunities while you fully explore the Harbour and its many distinctive attractions. These weekend cruises allow time for exploration on the shore as well as entertainment and breathtaking sights aboard the ship. A hop-on-and-off version of Sydney Harbour cruises allow visitors to do just that, hop off your cruise at various destinations around the Harbour and then jump on the next boat to take you somewhere new. The Opera House, Sydney Harbour Bridge and the water itself are just some of the gems in the Harbour. Sydney Harbour National Park and the Royal Botanic Gardens are exquisite places to visit to fully take in all the sights of the Harbour, as too is the beauty of Watsons Bay. The zoo, the street markets and the gardens also all rank highly on the list of things to do in Sydney. 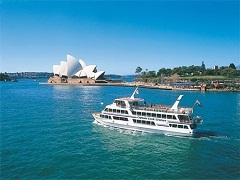 Sydney Harbour cruises will ensure that you are getting the most out of this amazing stop on your Australian adventure. Whether you are staying in Sydney or are just passing through, you own it to yourself to see all that you can in this beautiful part of the world.